CSU Extension Greenhouse Advisor: Do we really need all that water for quality bedding plants? Do we really need all that water for quality bedding plants? Water conservation is becoming an increasingly pertinent issue throughout the U.S. There is a great deal of information reported in the literature quantifying the water requirements of food crops and turfgrass; however, data quantifying the irrigation requirements of ornamental plants required to maintain healthy growth and acceptable quality is minimal at present. Past reports have classified ornamental plants as low, medium, and high water users based on anecdotal evidence. Yet, there is considerable variability among species. Responding to the drought in Colorado during 2002, Dr. David Hartley, Emeritus W.D. Holley Chair of Floriculture, and I collaborated with Yvette Henson, then a master of science graduate student. Yvette conducted a study on herbaceous annual ornamentals and their performance at decreasing levels of irrigation. Yvette's study was conducted to determine water requirements and quantify the growth, visual quality and health of 17 popular species of bedding plants grown outdoors under Colorado conditions compared to Kentucky bluegrass. The objectives of this research were to provide information on minimum irrigation requirements for annual herbaceous ornamental plants to be used by landscape professionals and eventually homeowners. This study was establsihed outdoors for ten weeks during the summer of 2003 in Fort Collins, Colorado. Plants were irrigated at 100% of the reference evapotranspiration (ET) (amount required to maintain Kentucky bluegrass in an optimum condition) for two weeks followed by eight weeks at five irrigation levels, 0%, 25%, 50%, 75% and 100% ET. Daily weather data (temperature, solar radiation, wind speed and relative humidity) were collected from a local weather station, which were used to calculate location-specific ET. The species studied were: Antirrhinum, Begonia, Catharanthus, Dianthus, Impatiens, Lobelia, Lobularia, Pelargonium, Petunia, Poa, Rudbeckia, Salvia, Senecio, Tagetes erecta, Tagetes patula, Glandularia, Viola, and Zinnia. Realizing that with a diverse collection of bedding plant species with differing growth habits, percent cover may not accurately assess plant growth when using only one plant spacing. To accommodate for that issue, the percent change in cover was also determined. The difference between the final percent cover and the initial percent cover was analyzed as percent change. Eight weeks after the imposed irrigation treatment levels, a visual rating of 3 indicated good plant growth with minimal signs of drought stress, insect and/or disease damage. The plants were fairly uniform and vigorous in growth and flowering. Visual plant ratings were averaged for each species within each treatment to determine the lowest irrigation level where each species still maintained acceptable visual quality. Each species was rated on a scale of 0 to 5, where: 0 indicated dead or mostly dead plants; 1 indicated poor or extensive wilting, curling, burning or discoloring, insect and/or disease damage to plants. ; 2 indicated fair to moderate signs of stress, insect and/or disease damage; 3 indicated good plant growth with minimal signs of stress, insect and/or disease damage; 4 indicated very good plant growth with no signs of stress, insects or disease; and 5 indicated excellent plant growth with no signs of stress, insects or disease. An evaluation score of 3 or above at any level was used to determine the lowest irrigation level where growth and appearance were acceptable. 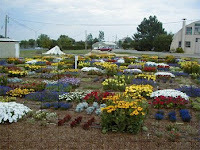 Begonia, Lobelia, and Viola grew well with a minimum of 50% or more ET based on Kentucky bluegrass. Impatiens grew well only with 100% ET. Antirrhinum, Dianthus, Lobularia, and Pelargonium performed well with 25-50% ET. 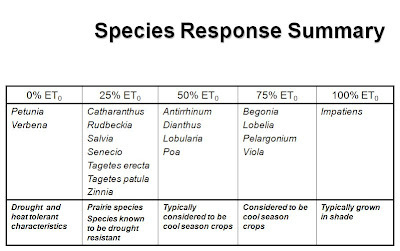 Catharanthus, Rudbeckia, Senecio, Tagetes erecta and Tagetes patula, Zinnia, and Salvia, which are adapted to mid-summer heat and low water, performed well with 0-25% ET. Species considered to be heat or drought tolerant, Petunia and Glandularia, required little or no irrigation. The bedding plant species evaluated in this study that required 25% or less ET are well adapted for low water landscape installations. Do we need all that water for quality bedding plants? Obviously no, but establishment and correct species selection is very important. See the complete research report as published in the American Society for Horticultural Sciences HortScience. Yvette Henson now works for Colorado State University Extension in San Miguel County. This research was sponsored by the Colorado Floriculture Foundation and Welby Gardens of Denver, Colorado.